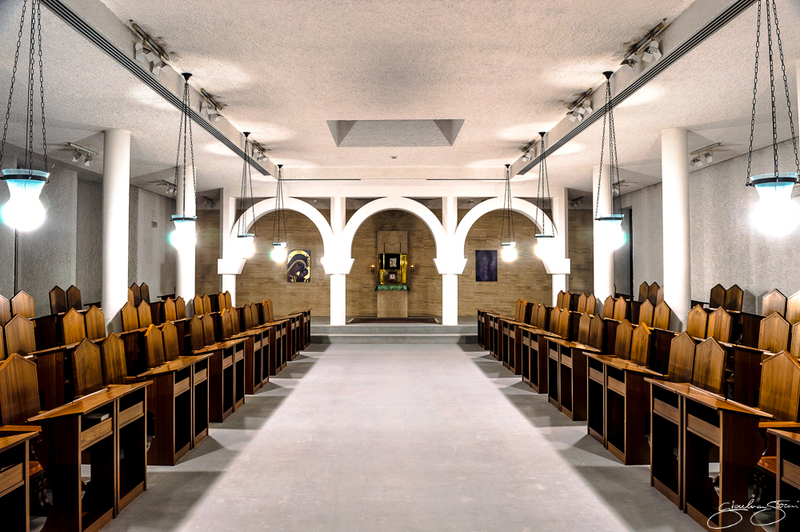 The chapel is one of the central places of the seminary. There the Eucharist is celebrated every day. The aesthetic corresponds to the will of the Second Vatican Council to promote the active participation of the faithful in the liturgy. 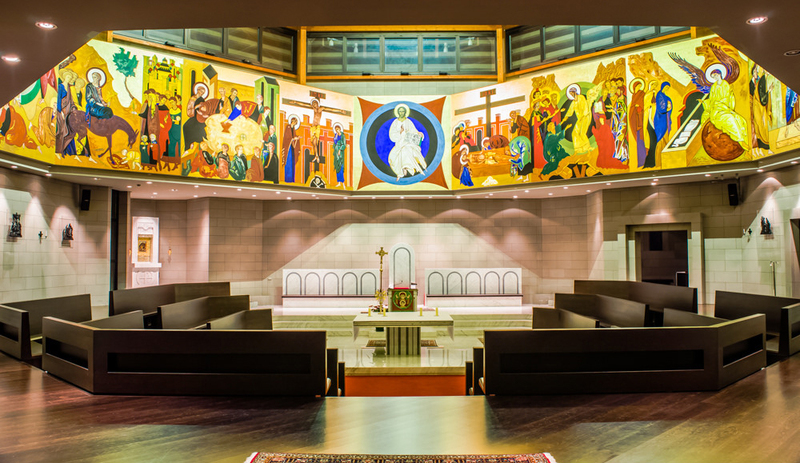 For this reason, this liturgical space takes the form of a body: the presiding priest represents Christ who is the head, the ambo from which the Word is proclaimed is the mouth, the altar is at the heart of the assembly which surrounds it like the members of the body. In this arrangement, those who participate in the liturgy are facing each other, each one can see his brother’s face, the community dimension of the liturgy is articulated through the personal prayer. The chapel is ornamented by a mysteric crown: the mysteries of the life of Christ and of our Redemption are represented according to the canons of the orthodox iconography. The main mission of these paintings is to allow the assembly, true focal point of perspective, to enter the history of salvation. Thus, they promote an authentic participation in the eucharist, in the Easter, which is the passage of the Risen Christ who brings us with him from this world to the Father. This space is inspired by Jewish culture. In Hebraism, a “yeshivah” is the center of study of the Torah (the Word) and of the Talmud (the tradition). In the seminary, the sanctuary of the Word is a place where the seminarians scrutinize the scripture in an atmosphere of prayer. For St. Jerome, “to ignore the scriptures is to ignore Christ”. The Word of God is not a dead word, it is actualized in the existence of himself who meditates on it. From then on, through regular frequentation of the scripture, the seminarians are called to become “men of the Word”. In this room, the walls are covered with a rough plaster that recalls the uterus in which the embryo develops. The Church, in which the Word is proclaimed and interpreted, is a mother who gives birth and educates the sons of God. “The glory of kings, to scrutinize the Word of God” (Proverbs 25,2). He who scrutinizes the Word is a king, he seats on a throne. 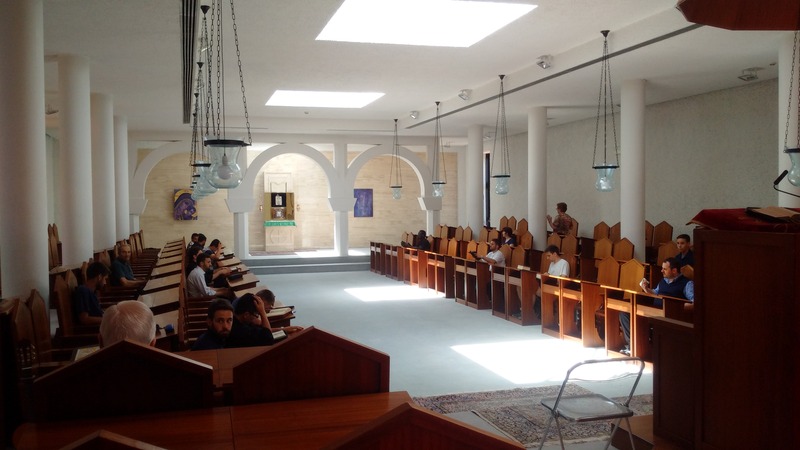 Thus, in the Yeshivah, the seminarians are installed in thrones, illuminated by a lamp in the form of a drop representing the Holy Spirit who assists those who meditate the Word of God. At the end of the sanctuary, a marble wall symbolizes death. It is only opened by the tabernacle in which are stored the holy species and the Word of God: only Christ has the keys to the mystery of death, through him eternal life is offered to men. The life of the Christian is called to become a liturgy of holiness. Thus, the meal is a privileged moment for the seminarians to dialogue, to be together and to experience communion. Round tables promote communication and allow each one to see the other. The seminarians take turns serving at the tables, so that those who eat sit still and be served with dignity. The large bay windows allow this room to enjoy a great luminosity. 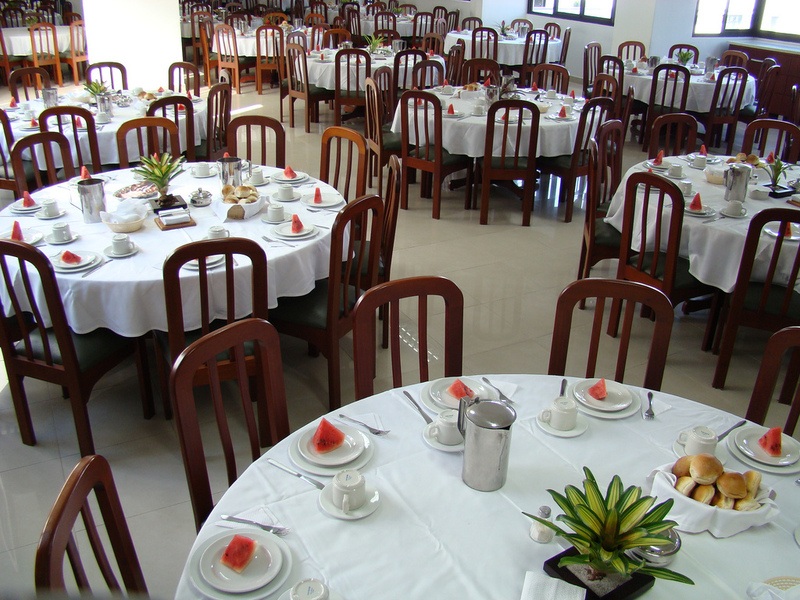 The refectory is also a place of celebration on the occasion of birthdays or other special occasions. 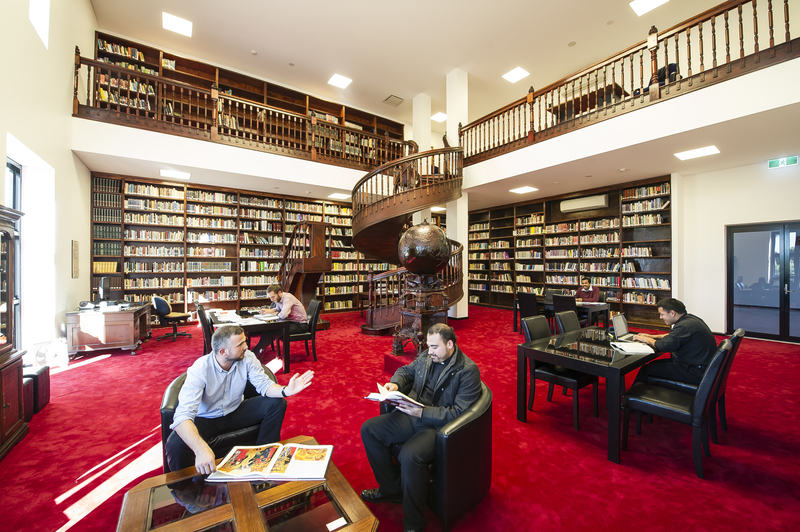 In the library, the seminarians enjoy a quiet place to study. Intellectual training is part of the journey toward the priesthood. In the encyclical Fides et ratio, John Paul II writes: “FAITH AND REASON are like the dual wings that allow the human spirit to rise toward the contemplation of the truth”.